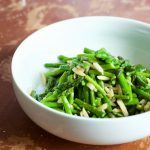 This sauteed ginger asparagus is a quick and easy side that is great on its own or mixed into your favorite dishes! This easy side dish is inspired by my mother-in-love. She makes something similar, and as I set out to make it, I realized I didn’t have nearly all the ingredients that she had…But, I will say it’s just as tasty! I made this as a side dish for our dinner, but we had leftovers and we mixed it into omelettes at our community group and it was amazing. The sautéed ginger asparagus is ready in less than 10 minutes, so it cooks up quickly right at the end of your dinner prep. It would also be a great addition to meal prep! Local Spotlight: Nothing super local today, but I did use a Colorado spice company’s all purpose seasoning that my mom got me for my Gotcha Day! I’m super stoked to use them, I’m sure you’ll be seeing more things with all of them incorporated. That’s it. Short and sweet today, so that you can get to cooking! Chop asparagus into one inch stalks. Heat olive oil and sesame oil in a pan on medium heat. 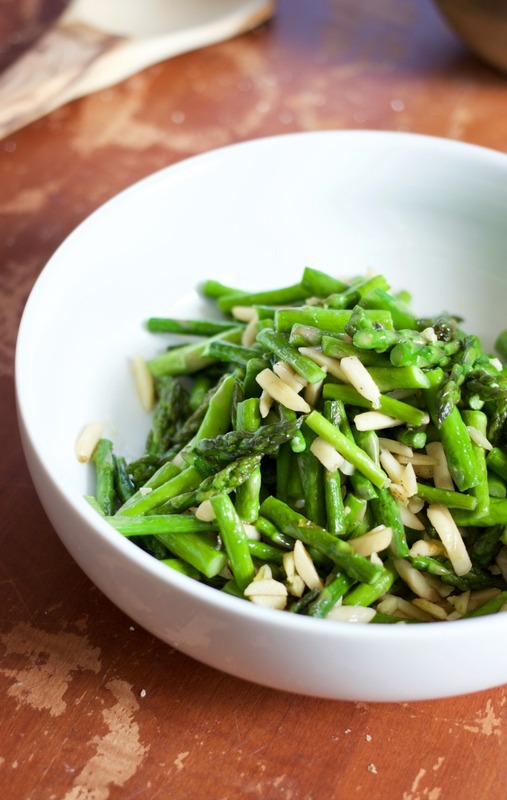 Sauté the asparagus, garlic, ginger, salt and seasoning and almonds together for 3-5 minutes, or until the asparagus turn vibrantly green. Yummmm!!! Looks and sounds delish! Yes!! The sesame oil isn’t too overpowering and the ginger isn’t either. Just gives it a nice bite!! I don’t think I’ve ever seen a recipe that moves asparagus in an asian direction and I don’t understand why. This looks absolutely delicious. Will definitely be using this one as soon as asparagus season starts in the North. Thanks! I hadn’t either! And I love the slight Asian flavor the sesame oil gives, without being too overpowering! 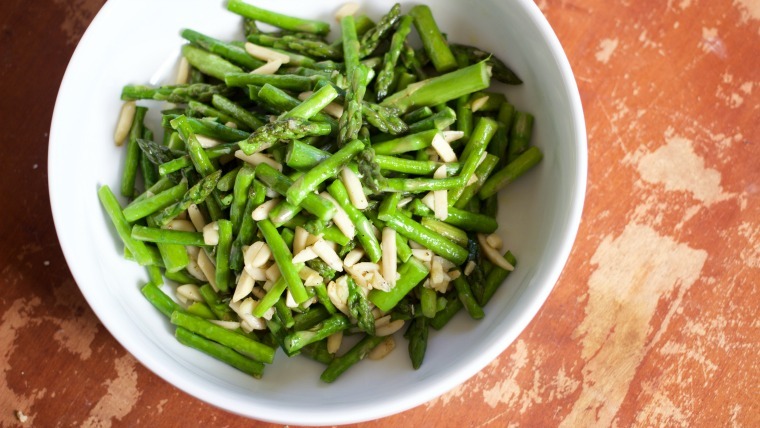 This asparagus recipe has me longing for spring! Asparagus is one of my favorite veggies and I’m always looking for new ways to prepare it, thank you! You’re welcome! It’s one of my favorites too! What a fun way to use asparagus! It is so nice and fresh in stores right now, so I have been buying a lot lately, and have been looking for new ways to prepare it. This looks so simple and yummy, can’t wait to try it! I’ve been making so much of it too! !